Ginger and I have both recently returned from European river cruises with Ama Waterways – me on the Garonne River in Bordeaux for a wine-themed cruise and Ginger on the enchanting Rhine. What a way to go! Here are our top 10 things we love about river cruising. 2. Visit small communities. Ever heard of Blaye? I hadn’t but turns out this town sports a 17th century citadel and UNESCO World Heritage Site – easy walk right from the ship followed by a stroll down the little town’s streets. 3. Rolling with the tides. I’ve always enjoyed traveling without a strict itinerary. The challenge and opportunity of a river cruise is that water levels can impact the posted itineraries. River conditions change and so do the ports. However you’ll be accommodated for all the major shore excursions – you may just be diverted to a nearby port and have the unexpected pleasure of discovering a new town! 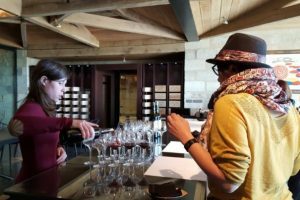 On our Bordeaux cruise, our departure was delayed due to high water (couldn’t get under the beautiful stone bridge) but we were able to venture out to taste amazing Sauternes with a fabulous sommelier tour guide and to explore Bordeaux in more depth. 4. Enjoy once-in-a-lifetime tours. Almost all the tours are included in the price of the cruise so you’ll have an opportunity to see something you’ve never seen before every day. I’d never heard of the Roquetuillade Castle near but decided after wine a-plenty to take the (included!) tour. This medieval castle, built in the time of Charlemagne, is still a home to aristocracy. Our soft-spoken tour guide sported a beret and corduroy jacket. He was a font of knowledge and at the end of the tour we all tipped generously – and then found out on our way back he is actually the viscount. It’s so expensive to keep up the castle the family relies on tours and even the tips! 5. Cuisine on board (and off). My friends and I had spent a few days in Paris in advance of the cruise and had some fabulous meals there. When we boarded the cruise ship, we decided to kick off our cruise with a champagne aperitif (included) and dinner at the intimate 25-seat chef’s table restaurant for a wonderful tasting menu. Every guest is treated to this experience once per our 7-night cruise, but each and every meal in the restaurant was also exceptional. Chefs are able to shop local markets and feature local cuisine – we thoroughly enjoyed our traditional duck a l’orange! Amawaterways is the only river cruise line invited to join one of the world’s most prestigious culinary organizations founded in 1950 in Paris. Every AmaWaterways vessel cruising in Europe is an official member of La Chaine des Rotisseurs. Membership is considered an achievement of world-class culinary acumen. 6. The people. Every tour guide, our cruise director, and ship staff were highly knowledgeable and knew you by name by the second day. And on board, with under 170 guests, we met and enjoyed the company of like-minded wine-loving passengers. Bay World Travel had also set up groups for Ginger’s Rhine sailing and my Bordeaux sailing so we had the bonus of friends and family along. 7. Do what you wanna do, go where you wanna go. I’ve got to tell you – I have high freedom needs so I used to balk at the idea of a cruise. A river cruise is perfect for others like me – and there are so many itineraries worldwide you can truly cruise on almost every continent and exotic destinations such as Myanmar and Botswana. 8. New family friendly itineraries and ships. Disney has chartered some of the Ama Waterways sailings and nobody does it better than Disney when it comes to families. And though the wine cruise was certainly more adult-oriented, bikes on board make it perfect for active families. A client of mine joked that when she took her young adult children they were able to beat the crowds of middle-aged and up passengers to the dining room! 9. There are distinct differences – and price points between the many river cruise offerings. I’ve focused on Ama Waterways but keep in mind this is just one of many river cruise lines operating around the world today. It is important to distinguish what is important to you – bikes on board, more inclusive with all beverages and gratuities included, etc. We have cruised or our clients have experienced all of the major lines. 10. Speaking of wine, it’s included with your meals! Wine and beer are complimentary with meals and there are special events as well with free-flowing wine. 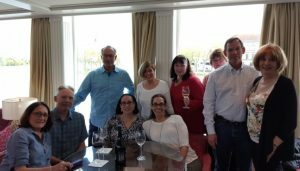 On the wine cruise, Ama Waterways typically has a wine host from a winery on board – we had so many extra tastings and presentations in addition to the shore excursions we were practically floating alongside our ship. Want to learn more about river cruising? Contact Mary, Ginger, or Tom at Bay World Travel. We’ve been on board with many of the top river cruise lines and we are here to advise and help you plan the perfect rolling down the river experience!